These conversion worksheets have problems with various levels of difficulty converting between imperial (customary) and metric unit of length using unit fractions and unit cancelling. 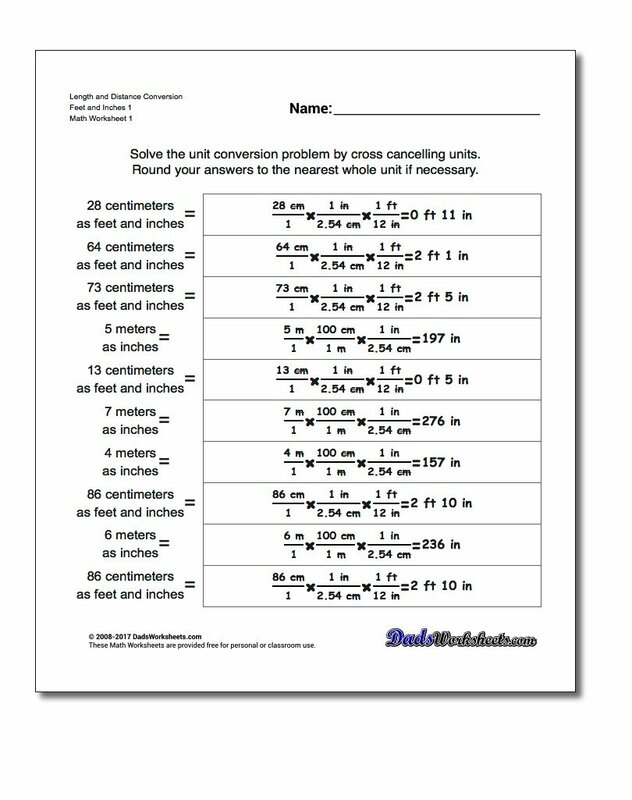 The answer keys for these worksheets show multiple steps where required to convert between the measurement system as well as between various unit scales, so they are very useful for understanding how to cancel units when solving a conversion problem. Converting between metric and customary unit lengths is all about converting centimeters to inches and back. These worksheets provider a solid base for the remaining sheets in this section. 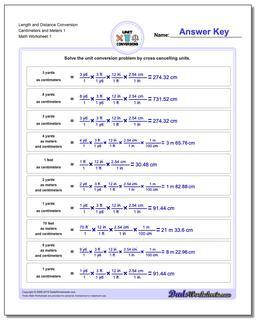 Unit conversion worksheets for converting customary lengths to metric/SI unit lengths. Unit conversion worksheets for converting metric/SI unit lengths (meter base units) to customary units. Unit conversion worksheets for converting both directions between metric/SI unit lengths and customary units. Once you have mastered converting between units in their own system of measurement, the next step is to learn how to convert between metric and customary units. The worksheets in this section introduce conversions between the two systems for mass, volume and distance measurements. Each of these conversions requires memorizing various constants. There are exactly 2.54 centimeters in one inch. This is the basic fact that needs to be memorized for any of the distance conversions between metric and customary measurement. To convert from cm to inches, we divide the number of centimeters by 2.54 to get the result. For example, to calculate 180 cm in feet and inches, we divide 180 by 2.54 to get approximately 70.86 inches. If we divide that value by 12, we get five wholes and a remainder of 10.86, which means 180 cm is equal to 5 ft 10.86 inches. We use a similar process to convert from inches to cm, employing multiplication by the same 2.54 constant. As an example, 6 ft 2 in converted to inches is 74 inches, and that value multiplied by 2.54 is 187.96 cm. The two groups group of worksheets on this page deal with the cm to inches conversion, inches to cm conversion, inches to meters, mm to inches and other similar conversions between the two systems of measurement. The worksheets are grouped with the conversions from metric to customary, customary to metric and a mixture of both types of practice problems.